The Long Version: Travel toothbrushes are one of those things that inherently compromise function for convenience. Where they fold, whether it's through a hinge or from a two-piece design, is invariably going to be a weak point. Hopefully it won't be so weak that the brush will fold over backwards at the slightest provocation, or completely come apart at the feeble hinge the way this one does. It's also nice when the 'closed' position covers and protects the bristles, rather than leaving some of them splayed out to the side of the handle. 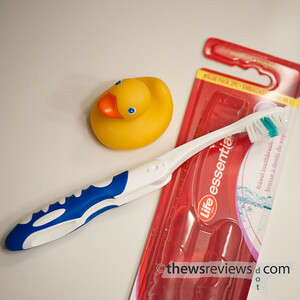 This folding toothbrush, marketed under the Life Brand Essential's line by Shopper's Drug Mart, is simply the pits. There's a reason why the two-piece style, where the brush head inverts and is stored in the hollow lower handle, is so common. It works. This one-piece folding design ranks right around 'better than nothing', so I'll probably leave it in my kit, but I'll be looking for a better one as well. On the other hand, given how easy it is to leave toothbrushes behind, maybe the two-for-one pack of disposable-quality plastic is exactly right. You pay your money and you make your choice. That's all well and good, but tell me, how does the rubber duck rate? The duck's cute, but tends to float upside-down. It's about half-scale, which makes it useful for decor; it's been sitting on my sink for about three years. I'd give it a 2/1 or a 3/1 rating, depending on my mood.